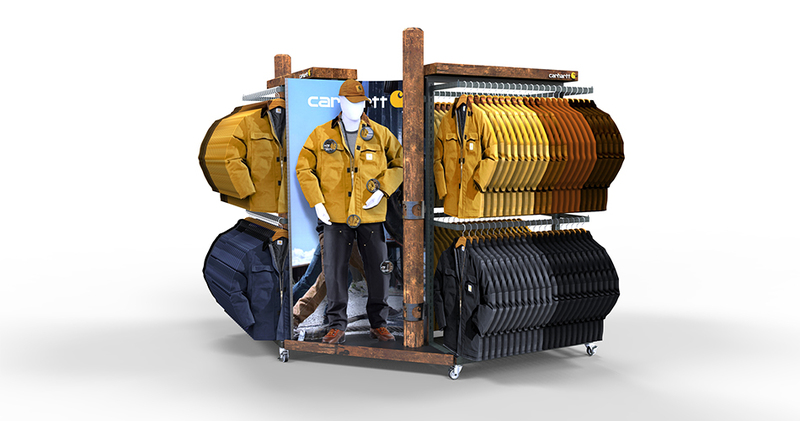 The design and production of these versatile units allow them to fit seamlessly with previously produced displays within Carhartt’s merchandising offerings. These modular units have actually inspired talk of a patent for the unique qualities and capabilities. 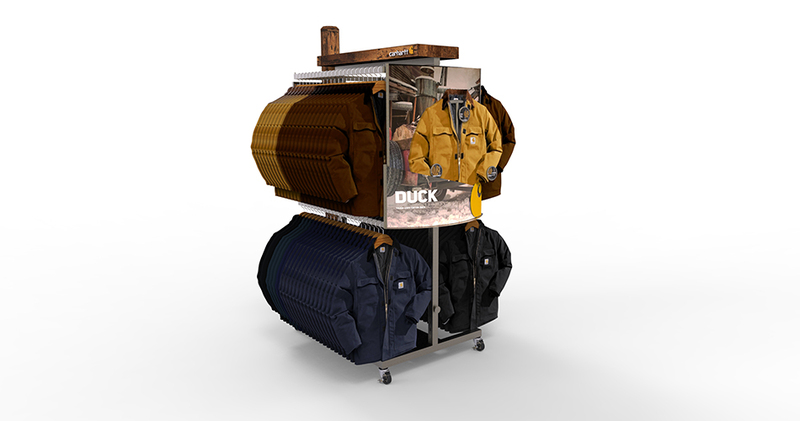 Globally recognized for their high quality, rugged apparel, Carhartt required a signature merchandising look for their “Innovations” program. 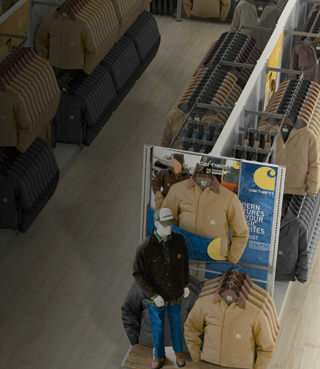 As part of this platform, Carhartt had several different fabric and textile technologies coming to market. 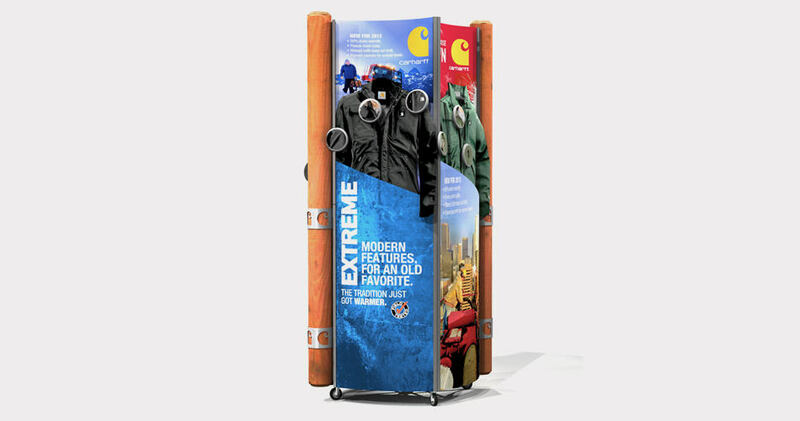 The task was to develop signage and a display system to help educate consumers about the program. Bench Dogs developed several distinct options to help bring the client’s vision to life. A blend of materials was utilized to achieve a rugged look, including the use of metals, urethane, plastics, and wood. Several attachment methods were utilized, including magnets for attaching shelving to the units. Six different display types were created, along with individual kits that allowed the units to fasten to any existing structures. The R&D period took nearly a year, with Bench Dogs working alongside Carhartt to implement all creative and logistical requirements. Thousands of units were produced as part of this expansive program, which utilized Bench Dogs’ proven global supply chains. Bench Dogs created an elaborate inventory database to manage the day-to-day transactions of the program, providing the client with an extensive amount of value-added services. The database funneled all aspects of the program, including the graphic kits provided by the client, to consolidate each action item into a clear, decisive format. The client was so impressed with the level of ingenuity involved in the design of all the hardware that Bench Dogs was encouraged to develop a patent. The program has been running successfully for over 3 years, with stores featuring the displays reporting spikes of over 45% percent in direct sales.